After having been knocked out by a demon in the previous issue, WW is carried down to a cellar dungeon and locked into a cage. The plan is for her to be sacrificed to the demon to provide it with a stronger physical body to inhabit. That's The Cheetah there in the other cage, btw. In the last panel, the demon drags WW out to be consumed, but WW has switched places with The Cheetah using some kind of illusion. I also included Brian Bolland's awesome cover for this issue. Wow, that was fast! This scene was actually better than I thought it would be! The fourth pic with Wonder Woman lying unconscious on the ground and chained is really well done. Excellent pics! I remember enjoying these scenes when the comic first came out! How could I find this full comics,what's the name of this comic? Exciting scenes indeed. Pic #4 is HOT. Beautiful scenes. 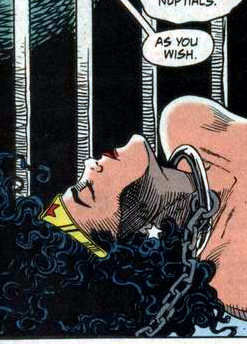 Love an unconscious Wonder Woman.